Sun Mage picks right up where Fire Mage left off. While I didn't think Sun Mage was as action packed as Fire Mage, it was definitely darker. A couple of times I hoped would be over my niece's head as I wasn't sure how to explain what was going on to her. I mentioned in my review of Fire Mage I felt the world building was lacking. It is more evident in Sun Mage. While there was ample opportunity to develop a back story for their beliefs and how the world works, these opportunities are not taken. My niece found the book confusing at times because she didn't understand where the kids where half the time. For me, fantasy is difficult to get into. I've mentioned before that I prefer fantasy with a foot in the real world (i.e. my world) and preferably the story is told from the point of view of a character being introduced into the fantasy world. 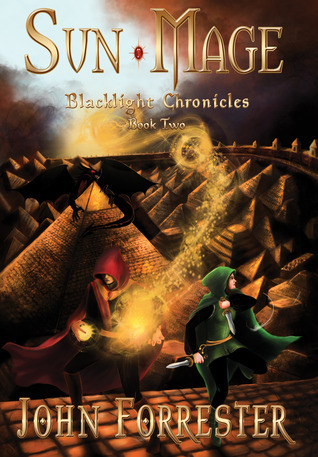 I still enjoyed the story line and curious about how everything will turn out in the next book - Shadow Mage. I just looked at the publishing date again for Fire Mage and realize that only a couple of months were between the release of it and Sun Mage. Perhaps John will take a bit more time with Shadow Mage and fill in some of the gaps that are missing in the first two installments. The plot is engaging, but I think with a bit more details about the world he has created there would be greater buy in to the story. Sun Mage is a quick read. Both my niece and I are looking forward to the next book in the series. Your turn: How do you like your fantasy fiction?